December 14, 2009 - Air Canada has won four top honors in Business Traveler's "Best in Business Travel" award program, the most first place awards won by any airline in the world in the influential magazine's annual reader survey. Best flight attendants, best in-flight services in North America, best airline for business class service and best North American airline for international travel. "Air Canada won more prestigious Business Traveler's top awards this year than any other airline. This remarkable achievement is a testament to our transformation, which is still on-going - especially to our renewed focus on customer service, to the further development of our premium product and to our investment in our international service. I attribute this success to the culture change that is being embraced by our dedicated and talented employees in all branches, as there is a direct correlation between engaged and empowered employees and a high level of customer satisfaction. The Air Canada leadership team is profoundly grateful for their hard work and professionalism, which is a source of great pride for the people of Air Canada. These awards also validate our decision to make substantial investments in industry-leading on-board comforts such as lie flat suites in Executive First, personal entertainment systems at every seat throughout our aircraft and the development of our Concierge program for our Super Elite customers," said Calin Rovinescu, President and Chief Executive Officer of Air Canada. "Our customers clearly appreciate the Air Canada experience, particularly the readers of Business Traveler, who fly on a range of leading global carriers and have chosen Air Canada as the best among its peers. Thank you to all of our employees who made it happen." Air Canada has been voted by the readers of Business Traveler as offering the Best In-Flight Services in North America, the Best North American Airline for Business Class Service, and the Best North American Airline for International Travel - all for the second year in a row. This year, Air Canada was also recognized as having the Best Flight Attendants in North America. Earlier this month, Air Canada was honoured by another influential business travel magazine when Global Traveler named Air Canada the Best Airline in North America and Best Airline in Canada. Results of the 21st annual "Best in Business Travel" awards were revealed at a ceremony last night in Los Angeles. Business Traveler is one of the world's leading authorities on business travel and the awards were based on a readership survey by the magazine, which publishes 10 editions worldwide and has more than 500,000 readers. Air Canada has renewed its international and North American fleets with new Boeing 777 and Embraer aircraft. Concurrently, Air Canada has completed a major refurbishment program of its existing aircraft to offer all customers brand new seats and personal entertainment systems at each seat, fleet-wide on North American and international routes. New fleet-wide amenities include digital quality in-seat monitors with touch-screen controls offering hundreds of hours of audio and video on demand programming, USB ports at each seat, standard in-seat power within reach of every customer and industry leading lie-flat bed suites in Executive First, Air Canada's international business class service. Air Canada provides scheduled and charter air transportation for passengers and cargo to more than 170 destinations on five continents. Canada's flag carrier is the 13th largest commercial airline in the world and serves 33 million customers annually. 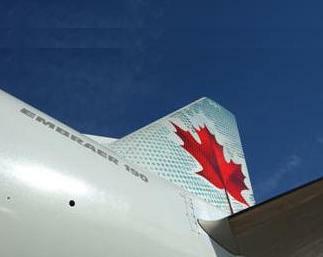 Air Canada, a founding member of Star Alliance, provides the most comprehensive air transportation network for Canadian domestic, transborder and international travel. As well, customers can collect Aeroplan miles for future reward travel through Canada's leading loyalty program.